Ships dock at the cargo docks at Muelle de Los Marmoles Port about a 30 min walk from Arrecife town center. You might also be docked at the new cruise dock La Boca de Puerto Naos, which is much closer to town (1km). Shuttles are provided, most of the time not free. Taxis to Teguise use their meter. It costs 18E/one way. Teguise was the capital till it was destroyed in 1730 by a volcano eruption. It is rebuilt with just tiny white houses like in Mykonos. Taxi to Arrecife will cost about 10 Euro per cab. Check here for festivals and events in Lanzarote when you are in port. The city owes its name to the rock reef ('Arrecife' is Spanish for 'reef') which covers the beach located in the city. Note: If your stay at Lanzarote is more than a few hours, you might consider a ship's excursion. The siesta is from noon until' around 5 pm and virtually everything is closed. El Charco de San Gines, a salt-water lagoon in the city center surrounded by fishermen's houses; La Casa de Los Arroyo a patriarchal residence emblematic of Arrecife and a declared Historical Monument which houses the "Blas Cabrera" Scientific center. Other interesting attractions include the Castles of San Jose, home to the international Museum of Modern Art, and San Gabriel, home to the Archaeological Museum. There are also the Casa de la Cultura Agustin de la Hoz and the 17th century Iglesia de San Gines, an important landmark of historical Arrecife. César Manrique had an enormous influence on the regional council who gave him free hand to do whatever he wanted. According to his autocratic aesthetic guidelines, no building – except church towers – should be taller than a palm tree. (The only ‘skyscraper’ on the island is one hotel structure in Arrecife but this was built during his absence from the island). He also banned roadside hoardings as well as the tipping of rubbish and electric cables had to be laid underground. He also recommended that all villages should only decorate in white and green – or the odd blue in coastal areas where he allowed it. He encouraged people to renovate their homes and maintain a certain character that is in keeping with the local environment. The Volcano House César Manrique Foundation in Tahíche is well worth visiting. Car hire is relatively cheap in Lanzarote. A hired car is the best option for discovering the remote wilderness regions. It only takes about 40 minutes to cross the entire island from North to South by car, and about 25 minutes across. Right outside the port is a car rental office, only a 50 meters walk, which rent cars for less than 40 Euros a day. Most major companies have a desk there. Cicar has very attractive rates. Look for the Muelle de Los Marmoles location. The roads on the island are in excellent shape. Places of interest on the island include Teguise (the old capital), with the Guanapay Castle set on a volcanic cone; the oasis-like Haría; Malpaís de la Corona, where an immense volcanic cave called Los Verdes, 6km (3.5 miles) long, is located; and the nearby Jameo del Agua lagoon. The National Park of Timanfaya is a spectacular stretch of lava which covers nearly one-third of the island and is awe-inspiring in its majesty and barrenness. The most popular excursion is to the volcanoes on camels. 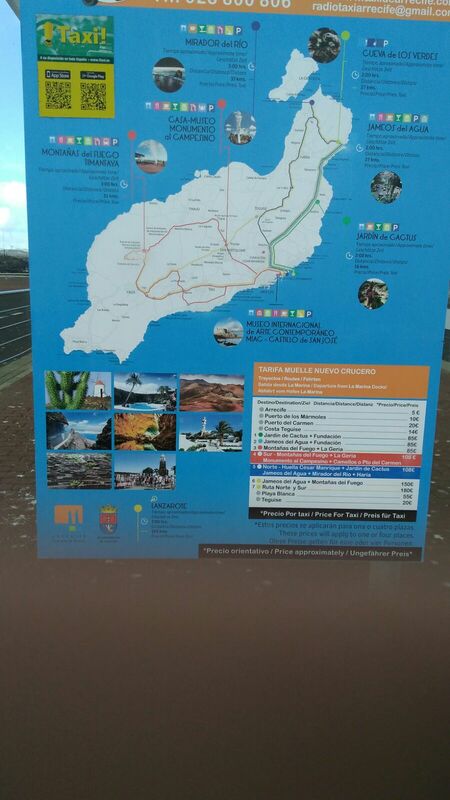 When you rent a car, drive towards Tinajo and from there follow the signs to Timanfaya. The first stop will bring you to the Mancha Blanca Visitor Center: An exhibition and overview of Lanzarote (free), The second stop will be Islote de Hilario: The 8 euro entrance fee includes an hour bus ride, a rather thrilling one, thru the volcano landscape and a "geyser" demonstration. Not to be missed. The last stop is a mile or 2 further, where the camels await you! Arrecife has three beaches: Playa Blanca, El Reducto and Guacineta. Playa El Reducto, just south of Arrecife, is said to be the best beach. Taxis charge about 150 euro for a four hour excursion. Taxi fares from the port. Shops and restaurants are centered around the waterfront avenues Generalissimo Franco and Leon y Castillo. Lanzarote and the rest of the Canary Islands enjoy a special duty-free Tax status. Cigarettes, Alcohol, Perfumes, and Petrol are much cheaper than in Mainland Spain and the rest of the EU. • There are eight different coins: 1, 2, 5, 10, 20 and 50 cents, and 1 and 2 Euro. • There are seven different banknotes, for the following amounts: 5, 10, 20, 50, 100, 200 and 500 Euro. There is an internet cafe in the main shopping street, across from the supermarket. Both stay open during the siesta. Wifi is available at many sidewalk cafes.